The LED Light Therapy Facial is a painless, relaxing skin-care treatment that plumps up aging skin by boosting collagen production and treats acne by killing bacteria. LED stands for light-emitting-diodes. First developed by NASA, LED works by sending energy-producing packets of light into the deeper layers of the skin. Hyper-pigmentation: Age spots, freckles, uneven pigmentation due to sun exposure. Most cases of skin hyper-pigmentation even out over time from the use of LED light therapy. Acne and blemishes: LED light therapy can assist in the repair of acne and blemishes because it stimulates the skin’s natural healing process, and helps to kill bacteria caused by Acne. Frequency: The number of treatments needed varies by skin type and condition. Some people see visible results almost immediately, however noticeable changes are usually achieved in 8-10 treatments for all. The results are CUMULATIVE. 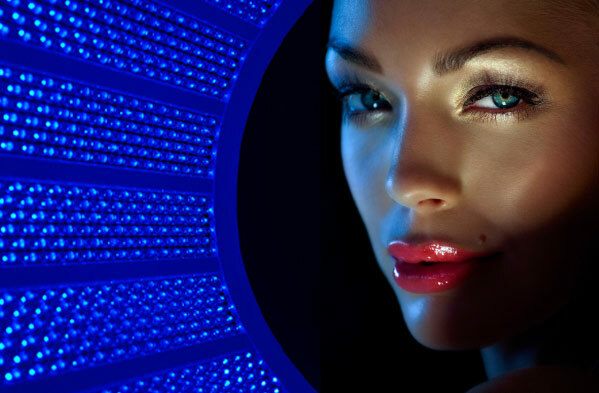 The LED Blue Light Acne Facial gets rid of Acne. The therapeutic light kills acne bacteria, reduces inflammation and speeds up healing. Deep pore cleansing, enzyme exfoliation, steam and extractions, and oxygen infusion are included. Healing antioxidant nutrients are infused with a detoxifying Oxygen Blast followed by the LED Blue Light Therapy. Our Cucumber Cooler astringent and Aloe & Azulene Masque soothes, calms, and balances the skin. The LED Red Light Face Lift treatment is a celebrity secret. The Red Light Activates Collagen! This treatment repairs and rebuilds collagen and elastin, which reduces wrinkles and brings your glow back! Included in this facial: Enzyme exfoliation, Vitamin A eye masque, Vitamin C lip treatment, a blast of oxygen to detoxify the skin and penetrate our botanical Hyaluronic serum and Vitamin blast of A, C, E, and D. A soothing massage of chest, neck and shoulders, tops off the whole treatment. The combo of LED Light Therapy, our ingredients, and treatments diminishes lines and wrinkles and reduces inflammation and redness. A series is required to obtain optimal results. Orange light helps to revitalize the skin. It has been shown to bring vitality to dull and lifeless complexions. Orange light is good for bringing a glow to the skin for special occasions. Yellow light reduces the appearance of redness, swelling, and inflammation. This color of light is beneficial for Rosacea and treating burns such as sunburns. Also stimulates the production of red blood cells in the skin and is effective in treating abnormal pigmentation (hypo and hyper), improving lymphatic function, and stimulating circulation. Green light is absorbed into the skin where it has a calming effect. It helps to lighten hyper-pigmentation spots revealing a brighter complexion. The calming effect also has anti-inflammatory properties that soothe the surface of the skin. Green LED Therapy is used to treat dilated capillaries, sagging skin around the eyes, under eye circles, hyperpigmentation and sun spots, even sagging breasts. LED Light Therapy are wavelengths that are able to pass through tissue up to 1 inch deep. Red and near-infrared have beneficial effects on cells by “kick-starting” them into immediately creating more ATP (cellular energy) and increasing DNA and RNA activity. Red light LED stimulates the fibroblasts that produce collagen, which gives young skin its plump look. 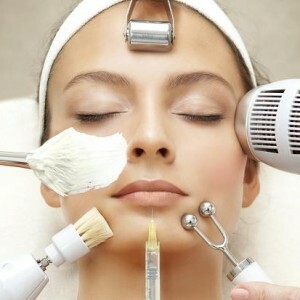 LED machines can also minimize fine lines and wrinkles, treat sun-damage and stretch marks, and reduce redness.